Ubet is one of the most recent bookmakers launched in April 2015. The site is a product of re-branding on several products owned by Tatts Group. The Australian company didn’t have enough popularity and decided to remake their already established brands into a new one. By combining them, Ubet now operates in four states – Queensland, South Australia, Tasmania and Northern Territory. Head of the company is CEO Robbie Cook. Ubet has put a lot of effort in developing their online presence through a mobile and tablet application. They are looking for newer and impressive ways of betting. With over 1400 retail outlets in the already mentioned areas the company shows that it’s here to stay. 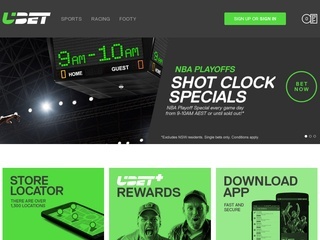 Ubet added to the existing sponsorship deals by making new partnership deal with some of the most famous Australian football clubs – Port Adelaide Football Club and Melbourne City Football Club. The company also became the sponsor of V8 Supercars. With very innovative approach and excellent racing, coverage Ubet is striving for success. The popularity of Ubet has risen a lot during the last three months. Up 187000 places, the bookie is now among the top 250000 most viewed sites globally and 3804th in Australia. The website design is very sleek and modern. The colors don’t hurt the eyes and everything can be easily found for the best user experience you can get. As a recently created betting platform Ubet have made an effort to be creative and make a site that is easy to use and understand. Even from the first look you’ll quickly notice how everything is very simple and minimalistic. There are no flashy banners or something that startles you. Every detail about it speaks of a well thought design and functionality. Once you clock on the sports icon, you’ll see a drop-down menu that is ordered alphabetically. There you will find all the sporting events available. As an Australian bookmaker, you can expect to find Australian rules, Footy tipping and Surfing. Apart from the well-known Soccer, American Football and Tennis there are some special markets. One of them is the relatively new for most bookmakers E-sport section. In the Racing menu, you’ll find a very nice selection of Horse racing, Greyhound racing and harness racing markets. Under the main menus, you’ll notice the “Next to play” feature where you can see which event is starting soon. It is very helpful for people who like to stay informed about upcoming sporting events. Now, Ubet has encouraged their users to try the dedicated betting application, and there are some features that you should check out. For starters the “Live racing vision” gives you the opportunity watch races on Sky1 and Sky2 on your mobile device. You can scan your credit card with the camera on your device, and it will automatically register it. Also, you set a PIN or fingerprint authentication when you need easy access to the app. With the idea of “Liver racing vision,” you can expect that the site will have a lot of markets for horse and greyhound racing, and they don’t disappoint. Fixed odds and tote are available for most races. Of course when you’re the owner of sports betting platform you can’t only rely on racing events. Odds for soccer matches are also available. While they don’t have a ton of wagers for Soccer, they do have the Correct Score, Half-time/Full-time, and Over/Under Goals. With the company quickly gaining popularity there should be an improvement soon for these types of bets. Overall, for a relatively new bookmaker Ubet does have quite a selection of odds available. Ubet has made an effort to please all their customers and make the safe and secure environment for the players. The site uses an SSL encryption that ensures the user that their personal data is protected well. They didn’t cut any corners in customer service as well. You can contact them via their dedicated phone line or send an email. Their customer support unit works 24/7 to make sure every user problem is solved fast and hassle-free. You can also contact the company through social media. Following the latest trends, Ubet has Facebook, Google+, Instagram and Twitter accounts that you can follow. Languages support for now is only in English. But as the company expands they will probably include a few more languages. To make it easy for their customers Ubet have made available all the major fund transferring methods. Bank wire is available along with credit and debit cards. The popular digital wallets like Neteller and Skrill are also covered. To withdraw money from your account, you can use the same method you’ve deposited the money. There are some limits for credit card users. An unverified user can only deposit $500 per week (per card). For a verified customer with an unconfirmed credit card, the limit is $2000 and for a Verified Customer with confirmed credit card is $5000. For international customers, the limits are reduced by 50%. Ubet doesn’t have a lot of bonus offers but like many bookmakers have, but they have made another option to reward their frequent players. The site offers the opportunity for players to accumulate points that later can be converted in free bets. 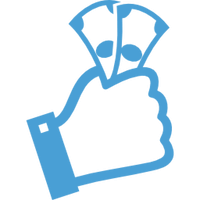 Every $1 the users bet on Tote, or Fixed Price markets will earn these points.